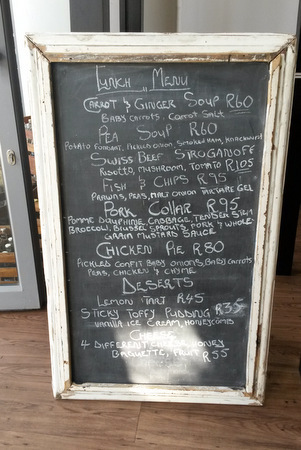 If you’ve worked in Cape Town’s foreshore offices this winter and stepped out for lunch, there’s a good chance Borage Bistro has been on your radar. Open for business since May in the new Portswood Building’s ground floor, this restaurant attracts pretty young things for eggs Benedict Saturday breakfasts on its wide terrace. Five-star hotels are within easy walking reach, but Borage’s magnetic field is primarily targeting financial institutions and corporates – FirstRand and Old Mutual employees are fast filling the Portswood’s floors, and Investec is opposite. These customers eat in 45 minutes, mostly ordering only one course. 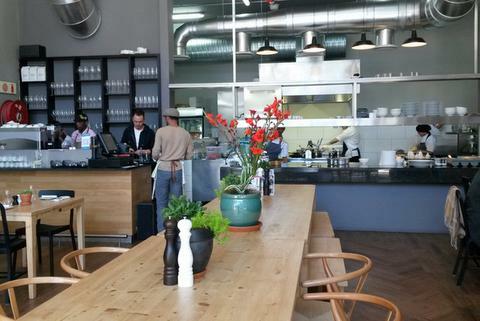 Windhoek-born Marks is in business with a food-loving banker, his childhood friend Christian Vaatz. They planned to wait another year, but an available vacant space changed all that. Marks is young to be focusing on a kitchen and running a restaurant, and knows it. He’s cooked under some big names, completing his practical studies under chef Luke Dale-Roberts at La Colombe, and joining the opening team when Dale-Roberts went solo with The Test Kitchen. 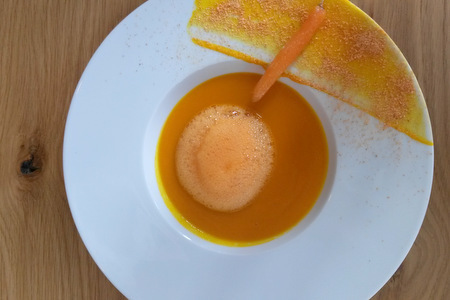 Originally inspired to pursue cooking after watching Heston Blumenthal’s ‘In search of perfection’ series, Marks moved to England in 2011 to learn from his hero. He spent long hours slogging at The Fat Duck and at Dinner by Heston Blumenthal. Returning to Cape Town in 2013, Marks rejoined his mentor at The Test Kitchen and The Pot Luck Club. So what can you eat in this glass-and-grey-walled space with bare wooden tables, fabric banquettes and two outsized lampshades? The signature dish is chicken pie, but it’s no bistro standard. It’s deconstructed into its parts, so a round pastry crown holds individual chicken pieces and garden vegetables with a chicken-and-thyme sauce. (All pastry and croissants are made inhouse.) Soup also has a cheffy element: purees topped with tangy foams, and slow-roasted veggie ‘salts’ on the plate. 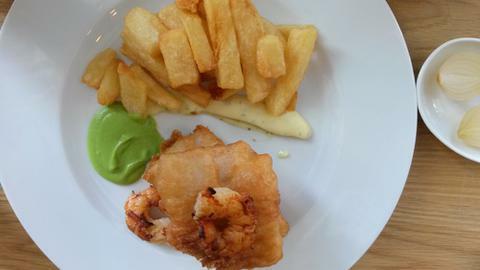 Those who order fish and chips receive ordinary hake, but vodka and beer keeps the batter wafer-light. The milk, onion and caper ‘tartare gel’ was a Blumenthal influence lost on me, but the same chef’s triple-cooked chips are well worth having. Funnily enough, Marks loved cooking but never set out to become a chef. He intended to do a one-year Silwood course to understand cookery basics, before switching to a career in something else. This article appeared in The Times on 27 August 2014.